The City is planning to waste your tax money on a “restoration” project that won’t do any good. Reedy Creek rises near Chippenham Hospital; it flows through Forest Hill park and into the James. The concrete channel built to control the flooding of and near Midlo Turnpike (esp. in front of the Evergreen plant) has led to high stormwater flows that erode the banks downstream. The City now plans to spend $1.27 million of your and my tax money to create a new floodplain on the City property across Crutchfield St. from Wythe High School to reduce erosion there. 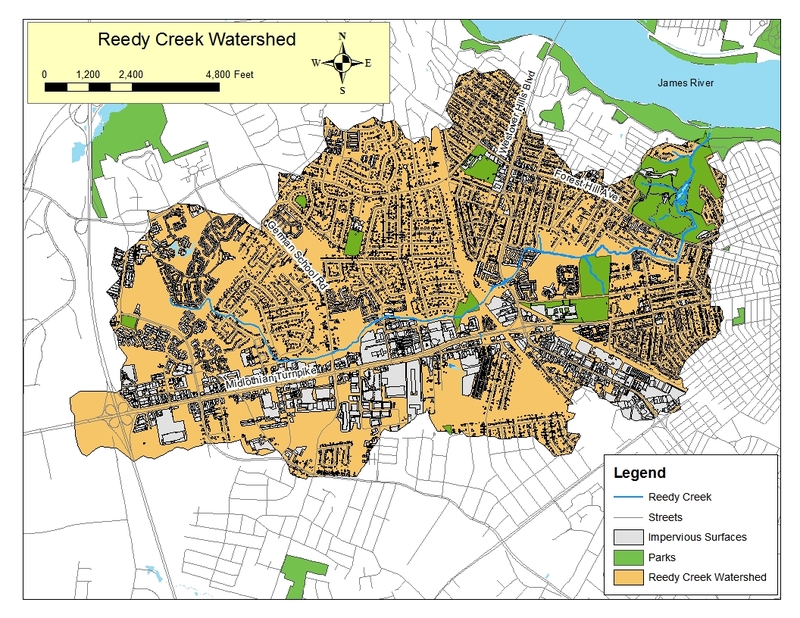 The Reedy Creek Coalition lists five major reasons for opposing the project. Their #4 should settle the issue: The money won’t do any good. “A forebay is basically a hole. It’s a settlement hole where the silt will kind of build up. We will be able to clear it out with a Bobcat and haul it off and it will fill up again. So the process will be able to continue. But it will not affect the lake so that the citizens’ investment that they have in the lake will certainly be safeguarded,” said Richmond Parks deputy director Roslyn Johnson. The City’s grant application to DEQ calculates that the new project will remove 150 lbs/yr of phosphorus and 98,736 lbs/yr of sediment. The calculation entirely overlooks the two forebays that already are removing most of this and other sediment and the attached phosphorus. So the City wants to spend $1.27 million to solve a problem that it already has solved. And they want Chesapeake Bay TMDL credits for removing pollutants that are NOT entering the river.